A waterplane prepares for takeoff in the waters around the 30,000 Islands in Parry Sound in Ontario, Canada. Small clouds hover in the blue sky as a waterplane is loaded up and prepares to take passengers on an adventure over the 30,000 Islands in Parry Sound in Ontario, Canada. A waterplane is a fascinating way to see the landscape as you get a totally different perspective of the area. 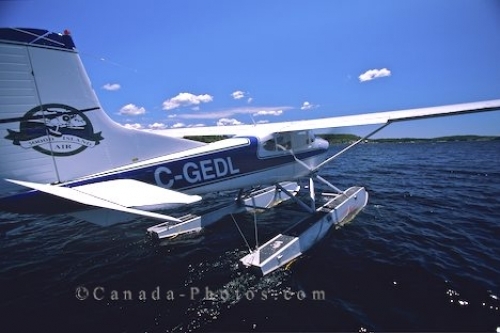 Waterplane, 30,000 Islands, aerial, Parry Sound, Ontario, Canada, North America. Picture of a waterplane leisurely motoring along the surface of the water of Parry Sound, Ontario preparing to take flight.